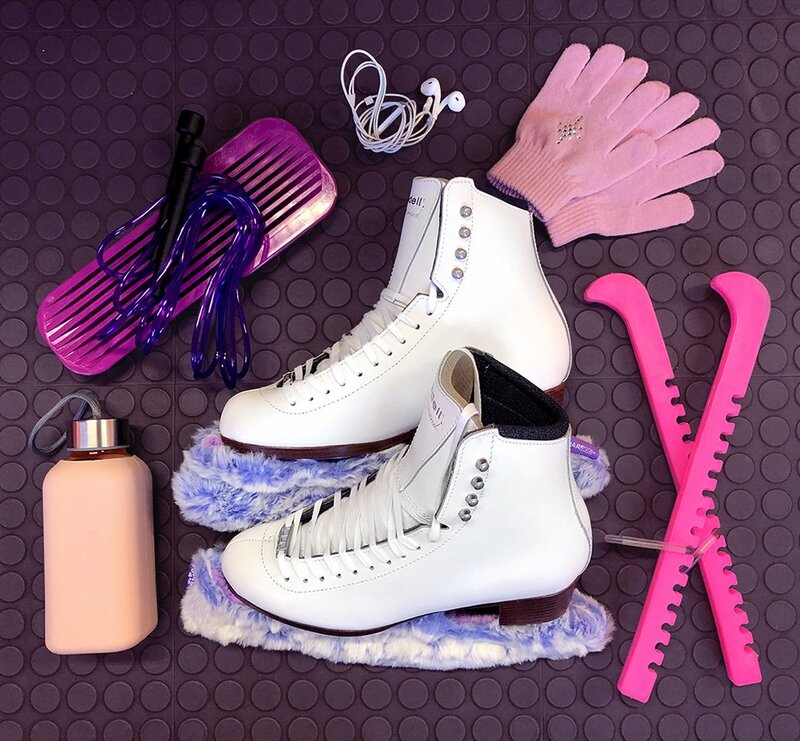 As a competitive figure skater, making sure you have high-quality figure skates is crucial to feeling comfortable on the ice and preventing injury. Adding foot support to figure skates is just what some skaters need in order to up their level of comfort while training or competing. If you’re looking for that extra figure skate support, you may want to consider custom figure skates or the R-Fit™ Footbed Kit from Riedell. Utilizing these tools can help you look and feel better on the ice! When it comes to support and comfort, there is no magic insert that fits every single skater. That’s why, with the help of a leading podiatrist and former skater, we created the R-Fit™ Footbed Kit, a comprehensive foot support system that is able to fit into all skate types. The kit includes three sets of adjustable arch support, one set of heel wedges, one set of heel lifts, two metatarsal pads, and an instruction guide. These inserts are designed to keep a skater’s foot ergonomically positioned inside the skate for increased comfort and better on-ice control. The R-Fit Footbed, is designed to alleviate discomfort and fatigue. The insert offers support and comfort for a safer, more effective skating session and is designed to keep the footbed from curling within the boot. To place it in your boot, trace your foot footbed and cut it to fit. Then place the insert in boot patterned-side up. Wear your footbed for a few days while skating and then look for an impression. This will help determine which pieces you may want to add to it. The three adjustable arch supports provide support for low, neutral, or high arches. These inserts are good for skaters who feel discomfort and pain throughout the foot or tendon strain around the ankle. The neutral arch support comes attached to the footbed but can be easily switched out if a skater still feels discomfort. A skater experiencing claw foot or discomfort such as soreness, tingling, or numbness in toes or the ball of the foot may benefit from utilizing the metatarsal pad insert. The pad helps to remedy that discomfort, spread the transverse arch, and reduce toe overextension by supporting the heads of the metatarsal bones. To properly place the metatarsal pad, use your footbed as a guide to locate the ball of your foot in the impression. Remove the adhesive and place the metatarsal pad right below the ball area, with the pointed end facing the heel. If you still feel discomfort after a session on the ice, adjust the pad’s location—a sore foot from a metatarsal pad indicates the pad is too far forward. When it comes to the heel, a skater has one of three options—a basic heel lift, pronation heel wedge, or supination heel wedge. If a skater is feeling irritation, pain or blistering around his or her heel area, or the heel is moving around inside the boot, they may benefit from a basic heel lift. This lift decreases heel movement and slippage for greater stabilization and comfort on the ice. Skaters with pronated feet experience their heels rolling down towards the inside and their arches collapsing. The pronation heel wedge corrects this by creating added heel support, stability, and shock absorption. It also evens the heel to allow for more consistent edge work and jumps. A skater who has supinated feet has the opposite problem as a skater with pronated feet. This means that when they are walking, their heels fail to roll down toward the inside of the foot and their step remains unevenly focused on the outside portion of their feet. The supination heel wedge corrects this problem, providing added heel support, stability, and shock absorption. If you’re looking for the best support, custom skates are a wonderful option. Not only can skates fit to your unique foot protect you from injury and blisters; they can improve your performance and have you hitting the ice in comfort and style. While custom skates may not be necessary for beginners, those who are more advanced or who want to compete at higher levels of competition should consider them. With a custom boot, you can choose color, leather temper, firmness, heel height, materials, and more, tailoring everything to your exact foot specifications. Plus, with the added R-Fit Footbed, you’ll have high-quality support that can have you performing at your best out on the ice. Don’t wait until your feet are screaming out for relief to get that custom fit and the support you need. The R-Fit™ Footbed Kit from Riedell can be a huge help if you’re looking for extra support in your figure skates. With the option to choose from various inserts depending on your needs, you’ll be able to find exactly what you’re looking for in a skate insert. Slip one into your customized figure skates, and you’ll have the most comfortable feet on the ice. Contact us today or head to one of our authorized dealers to find the perfect skates!